^ The Kazakh Miracle: Recovery of the North Aral Sea. Environment News Service. 2008-08-01 [2010-03-22]. （原始内容存档于2010-04-12）. ^ DRAINAGE BASIN OF THE ARAL SEA AND OTHER TRANSBOUNDARY SURFACE WATERS IN CENTRAL ASIA (PDF). [4 Feb 2016]. （原始内容存档 (PDF)于2016-02-06）. ^ 咸海东岸600年来首次干涸 生态危机日益严重(图). 网易. 2014-09-30 [2014-09-30]. （原始内容存档于2014-10-03）. Micklin, Philip. 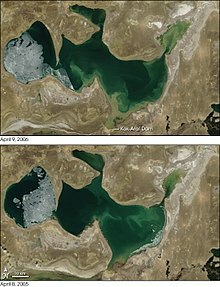 The Aral Sea Disaster. Annual Review of Earth and Planetary Sciences. 2007, 35 (4): 47–72 [2008-05-17]. doi:10.1146/annurev.earth.35.031306.140120. Bissell, Tom. Eternal Winter: Lessons of the Aral Sea Disaster. Harper's. April 2002: 41–56 [2008-05-17]. Bissell, Tom. Chasing The Sea: Lost Among the Ghosts of Empire in Central Asia. New York: Vintage Books. 2004. ISBN 9780375727542. Ellis, William S. A Soviet Sea Lies Dying. National Geographic. February 1990: 73–93. Ferguson, Rob. The Devil and the Disappearing Sea. Vancouver: Raincoast Books. 2003. ISBN 1551925990. Bendhun, François; Renard, Philippe. Indirect estimation of groundwater inflows into the Aral sea via a coupled water and salt mass balance model. Journal of Marine Systems. 2004, 47 (1-4): 35–50 [2008-05-17]. doi:10.1016/j.jmarsys.2003.12.007. （原始内容存档于2008-02-14）. Sirjacobs, Damien; Grégoire, Marilaure; Delhez, Eric; Nihoul, JCJ. Influence of the Aral Sea negative water balance on its seasonal circulation patterns: use of a 3D hydrodynamic model. Journal of Marine Systems. 2004, 47 (1-4): 51–66. doi:10.1016/j.jmarsys.2003.12.008. Aral Sea Foundation. [April 2010]. The Aral Sea Crisis. Union for Defence of the Aral Sea and Amudarya river (UDASA). [April 2010]. MirrorMundo. UNESCO promotes unsustainable development in Central Asia. Indymedia. February 2007 [April 2010]. Syr Darya Control & Northern Aral Sea Phase I Project. World Bank Group - Kazakhstan. December 2006 [April 2010].